I have 2 VSPs 4450 connected via V-IST working good. I am trying to connect a ERS in both VSPs with MLT. When I leave MLT connection on the VSP as standard it works good but when I enable the SMLT I lost connection. Post an output of "show mlt" command from all three switches. MLT 1 looks fine (it's configured as SMLT). Although you mentioned ports 1/12 should be the members of the MLT and there are four members 1/11, 1/12 on both VSPs. Please show us also output of "show isis spbm" from both VSPs. I removed port 1/11 from each VSP already. I thought there might be a problem with SMLT-VIRTUAL-BMAC. But according to the output it is also set on both VSPs. So it is in state when you disable one leg of SMLT the ERS starts to respond? @Martin Sebek vitrual-bmac is configured fine. The V-IST is working good. No, if I enable the SMLT in one leg I lost comms. No I mean do not touch the configuration (leave smlt enabled on MLT 1 on VSPs) and just shutdown one leg. The value of MLT CURRENT should change from smlt to norm. Then try to reach the switch. It would also be interesting to see "show vlan interface vids 1,2" and "show vlan interface info 1,2" on ERS. But I believe you've already doublechecked this. 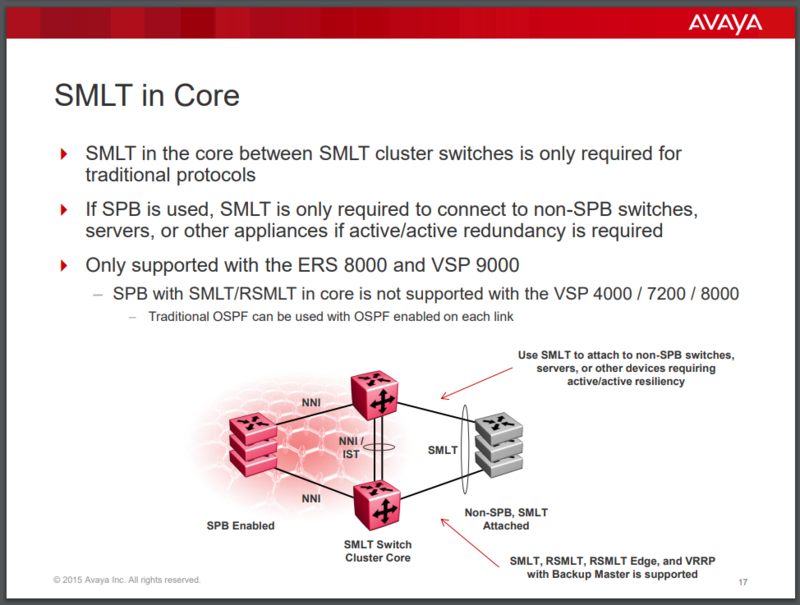 that mentions that "SPB with SMLT/RSMLT in core is not supported with the VSP 4000/7200/8000. Not completely sure what this means. I'm pretty sure we used a scenario similar to above with VSP 8404 switches in the core with SPB and ERS 3500 switches on the edge connecting with SMLT. Maybe the VSP4000s still don't support it. So, is this just outdated or am I misunderstanding it. It means that you could have a core link being NNI + SMLT at the same time. This capability however was only useful in migrating to SPB, existing networks based on ERS8000 where SMLT was used in the core with Square and Mesh topologies; the VSP9000 inherited the same capability, but this was then dropped on newer VOSS VSPs, since it was no longer needed as the more recent VSPs are pretty much always deployed with SPB to start with. It is not related the post at hand. Normally we recommend to use the penultimate byte to enumerate the nodes and then we normally make the smlt-virt-bmac same as bmac of one of the VSP nodes with 'ff' as last byte. Though your config should also work. If you have connectivity problems I would start by looking at the VLAN MAC-table on the VSPs for the ERS MAC at hand to see what is wrong.